It has become winter in Dresden and the temperature is often below zero. To keep your hearts warm when it’s cold outside, we are about to hand you a musical fireplace. 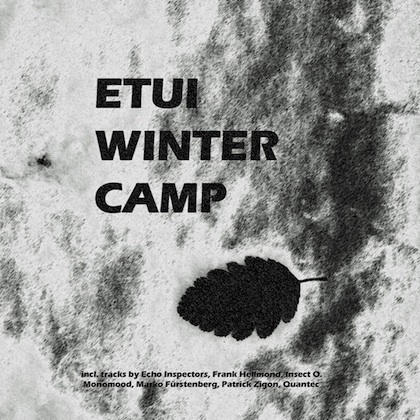 Etui has opened the winter camp and invited friends and fellows to leave you with (non-freezing) goosebumps and a smile, when they open their boxes of Dub- Deeptechno and Ambient tracks. Join the acoustic pleasures of the Echocord and dubtechno legend Qantec with his ambient techno track “Inocybe” alongside the australian dudes of Echo Inspectors with their track “Pleading Ground” and Frank Hellmond’s “Sunday”. With “Two (Redub II)“ and “Reduc_”, Melted Recordings fellow Madera delivers the more techno inspired tracks for the compilation. Our label artists Insect O. and Monomood deliver some fresh and unreleased stuff beside the awezome Marko Fürstenberg Remix of “Birds Over Hong Kong” and the ear catcher “Oktrosis” of our first ETUILTD edtion. With “The End My Friend” Biotob Label boss Patrick Zigon from Konstanz presents his own idea of modern detroitish techhouse and closes with this the 80 minutes of amazing music. All tracks mastered by Salz Mastering Cologne. Track 3, 5, 7, 9 licenced from Melted Recordings. Track 4 taken from ETUILTD001 Monomood – Okstrosis. Track 8 taken from ETUILTD002 Insect O. – Birds Over Hong Kong. Published by copyright control. All rights reserved. Copyright by Etui Records 2013.